I’ve dabbled in these before but i never took them seriously. The structure isn’t that good. They can become a crapshoot at the final table but I’ve adjusted well. Lots of dead money in these. I haven’t made a ton of money playing sngs on FTP but, I plan to change that in the coming months. Monkey pushbot poker is a lot easier than playing post flop in cash games. There’s a good reason why online pros are 20 tabling sngs. Impressive graph. Now explain what you did different after playing 1,500 games and what adjustments you made again after 4,200 games. You have been a professional (playing poker for your primary income) for some time now. Do you consider yourself successful? Is your income comparable to before when you were a working stiff? Quality of life better or worse? You thinking about going pro newinnov? Ha ha. You made my day blaargh86. I’m a bad amateur, until I get that under control, I have no chance. Of course when I retire from my current job in about six years I’ll see what happens before taking my final career job. Ha, ha, that is soooo funny. It takes study and practice to develop a winning SNG strategy, and the mindset to play it correctly but it can be done. 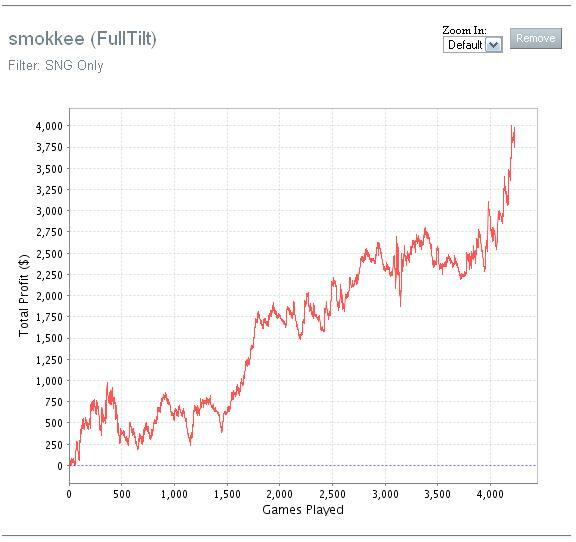 I find that tight solid poker early on, and then getting ultra aggressive late in the tourney tends to work. Sure you bust out, but over several games I tend to have a good ROI.